Before starting my internship, I worked at The Keep as a temporary Archive Assistant for East Sussex Record Office. One of my responsibilities was to ‘pick’ boxes from the repository and deliver them to the production room, ready for readers to see. This hands-on process was my introduction to the Mass Observation Archive (MOA). A lot of the MOA box titles made immediate sense: Women in Wartime, Children and Education, Summer 2012 directive: school, teachers and pupils... But try as I might, I just couldn’t work out what ‘Worktown’ could be. My initial impression was of some small Playmobil world! It all became clear when I looked at the work of documentary photographer Humphrey Spender, while planning activities for MOA’s new outreach cases. 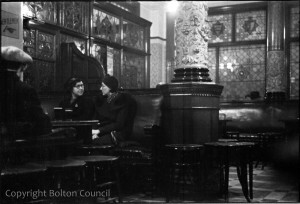 Between 1937 and 1940, Mass Observation began its initial study of Bolton and Blackpool. Tom Harrison gave this preliminary investigation the title of Worktown, and its everyday life was recorded by a small group of Mass Observers, including Spender. 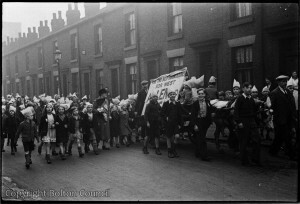 From pub to politics, his black and white photographs gave a broad overview of Bolton – an industrial town on the brink of war – and they are now the perfect inspiration for young learners about to engage in their own observational practice. It is interesting to think that this opinion was held in 1937, just two years before many of these ‘young men’ would be serving in the Second World War. The Worktown collection covers a huge amount of topics and I am constantly surprised by what I find in each box. I initially started looking through the sports box with the intention of finding some pacey recounts, but I also discovered details about people’s tastes, popular opinion, politics and much more. This is what I love about MOA – you never know what you’re going to find!